We have made the largest lampshade frames to date. 1.2 meters high. 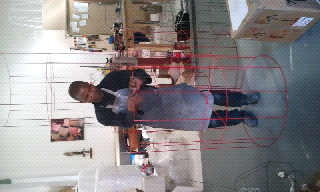 Alex, my wireman, got in the frame, just to show you how big it really is. We look forward to receive the special printed canvas tomorrow, to cover it with.